It's no surprise that I found something cupcake related. I think I've said the word "cupcakes" in Chic & Green at least once a week for months. What a cute and oh so feminine ornament! 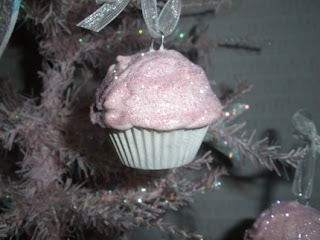 This is actually a set of 3 mini cupcake ornaments for $6.99 from Bella Chic Boutique. I think I would actually tuck these into some pine garland and hang it over my kitchen window for the holidays. Do you have a daughter who is away at college? Why not give these to her to add some feminine Christmas flair to her dorm room? Or if you have a young one at home, these would be great for a princess-themed room.